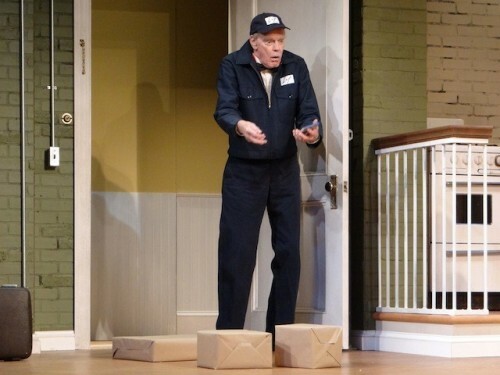 Lesley Shires as Corie and Tom Roach, the Telephone Repair Man in Act I.
Evan Thompson as The Delivery Man in Act I. 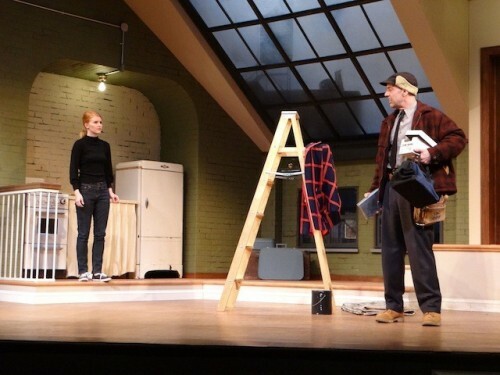 It is 50 years since Neil Simon's Barefoot in the Park was first produced on Broadway. It reflects a time when young men pursued important careers while wives entertained themselves by decorating the home and arranging social events, with the aim of making their husbands happy. It is a light, entertaining romantic comedy pairing opposites the production of which at the Dorset Theatre still generates plenty of chuckles. Barefoot starts in an empty Manhattan fifth floor walk up on the 7th day of the marriage of Corie and Paul Bratter. The furniture hasn't yet arrived. Corie is happily arranging flowers and otherwise preparing for her husband's arrival in this apartment that she has chosen. She is blissfully unconcerned about the lack of a bathtub, the bedroom that can only accommodate "a large single" bed, and the five tortuous flights to their front door that leave their visitors gasping for air at each entrance. Corie's pragmatic husband Paul arrives and, once he catches his breath, lets it be known that he likes taking baths and having heat in the winter (It's February and the radiator isn't working). He traces the origin of the prevailing interior wind to a broken skylight window that Corie hasn't even noticed above the couch. And so we are introduced to the basis for the comedy in this play, the adjustment to marriage of a spontaneous and free-spirited wife and a practical and earth-bound husband. When her mother visits, the impetuous Corie hatches a plan to pair her with their offbeat upstairs neighbor, Victor Velasco. The two couples have an evening of unusual food and too much ouzo, which results in an argument between the newlyweds and threats of divorce. In the third act Corie laments her impulsive behavior while Paul, with the aid of a prodigious amount of alcohol, explores the impulsive side of his nature. The Dorset's production is light and enjoyable, especially because of the skill of the supporting cast. 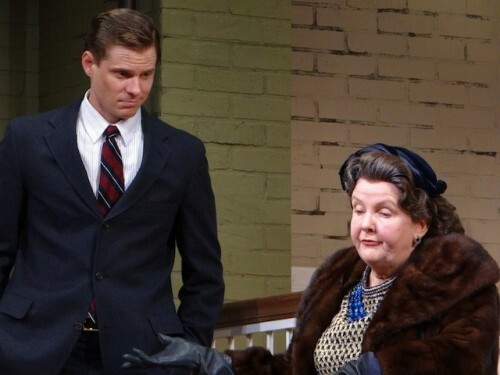 Amelia White plays Corie's mother, Ethel, with charm and subtlety. Her timing and natural delivery of lines is at once warm, realistic, and unfailingly funny. She simply lets the comedy happen. Geoffrey Wade, as the unconventional womanizing neighbor, Victor Velasco, downplays his character's kookiness to humorous effect, as though entering his own apartment by climbing out a neighbor's window and walking along a fifth story ledge is unworthy of notice. His droll flirtatious advances avoid lechery and come across as mischievous teasing. Tom Ferguson sparkles in his two short scenes as the telephone man, a friendly and helpful fellow who is an accidental observer of the couple's post argument silent treatment. Unfortunately the Dorset's production lacks a romantic spark between the two lead characters. Though there's plenty of kissing and even a bit of grinding, there's no sense of the romance and desire that should be the bond between these two polar opposites. The arguments lack passion and pain, so the reconciliation fails to elicit a sense of relief and rekindled fire. Though Lesley Shires, as Corie, is vibrant and energetic, her delivery and physicality is somewhat mechanical, without the truth and various levels of emotion backing it up, which makes her character two-dimensional. Tony Roach's buttoned-down Paul also misses the mark emotionally, though his third act drunkenness is nicely played. The set, designed by Kevin Judge is charming and works extremely well with its various levels and playing areas. The skylight gives rise to a real sense of danger in the third act. The audience enjoyed the play, chatting about their own early days of marriage at each of the two intermissions. Barefoot in the Park runs at the Dorset Theatre Festival until August 10.